Watch full One Piece Season 15 Episode 58 English Dubbed full HD online. One Piece Episode 574 English Dubbed online for free in HD. The Straw Hats are heading to the New World. Nami is taking a bath in the Thousand Sunny and Chopper comes in. Nami asks Chopper if he wants to join her in the bath and he says no claiming that he took one two days ago and the cloud reminds him of cotton candy. Sanji and Brook walk by and saw Nami taking a bath so they stare at her. Nami asked Chopper to move aside away from the cloud she made and the cloud electrified Sanji and Brook. Chopper claims he is scared and he won’t eat the cloud. Meanwhile Luffy, Zoro, Usopp, Franky and Robin are hanging out. Luffy tells Usopp to hurry up with the fish hook because he wants to catch and eat a big fish. Robin says that Luffy and Usopp are having fun. Franky says he wants Cola with a big fish. Zoro says he wants to have a drink to celebrate entering the New World. Luffy, Zoro, and Usopp sees three big fish. Zoro wants to eat a fried fish with salt. Usopp wants a fish sliced up and grilled. Luffy wants a fish with mayonnaise. Usopp says which fish Luffy wants and claims that it is not edible. Luffy punches the fish with gear second and Usopp uses the fish hook to grab hold of it. 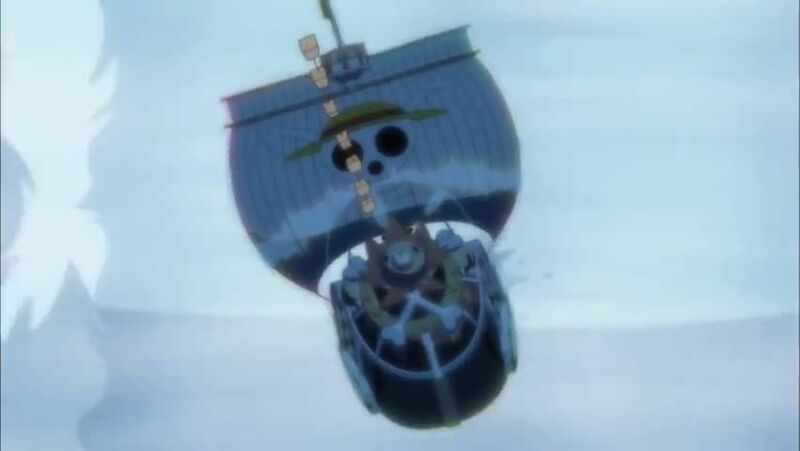 The fish that they caught suddenly got ate by a bigger fish and Zoro uses 360 pound cannon killing it. Nami is still in the bath and she claims that the rest of the crew are making too much of a ruckus and that she shouldn’t have trusted them in watching the ship for her. They suddenly got caught in a White Storm and Luffy claims it is the wormhole of his dreams and Usopp slaps him for saying that. Nami claims the crew to be stupid for getting into too much trouble while she was taking a bath. They get caught in the White Storm and they try to hang out to something so they won’t fly out of the ship. They finally crash into a whale without noticing at first. Brook then claims that the whale is Laboon but they finally see a whole bunch of whales and the others claim that Laboon is not here but in the first half of the grand line. Sanji then says that they need to get out of there and asks Nami about what they should do. Nami says they don’t need to do anything and Sanji listened. The Straw Hats asked one of the whales to give them a ride to the surface of the New World. Brook sang a song for the whales so they can bring them to the surface. Before they got to the surface the Straw Hats remembered the times during their training to become stronger so they can regroup and head towards the New World. They finally surfaced and Thousand Sunny hopped off the whales and landed onto the ocean. The Straw Hats say goodbye to the whales and they see some ships claiming they are pirate ships but then they saw that the ships belong to the Marines.